Modern molding practice dictates certain principles of design which should be observed if molded articles are to be produced successfully. Most elementary is the fact that the piece must be easily removed from the mold after it has been formed. This point is frequently overlooked, and many products are designed with undercuts which make it impossible to eject them directly from the mold cavity. If undercuts are essential, then split molds or removable mold sections are required, and these increase the cost of molds and of the molded articles. Undercuts should always be avoided unless mechanical construction or the function of the piece make such a design an absolute necessity. When undercuts are located in the outside contours of the piece, they are called external undercuts. It would be impossible to withdraw a piece of such a shape from a one-piece mold cavity. While many articles of this nature are produced, their cost is considerably higher than that of one designed to permit direct withdrawal from a one-piece cavity. 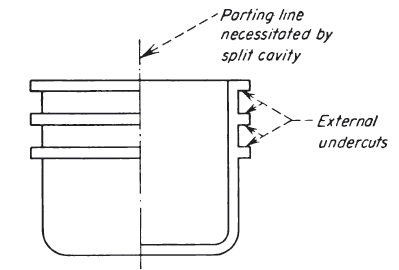 For molding such pieces, the cavities are built up of two or more loose members. These are tightly retained in a chase block. After the piece has been molded, the loose members are parted and the molded piece is removed. A parting or flash line is inevitable. When undercuts occur on the inside contours of the molded piece they are termed internal undercuts. Such a piece may be removed from the mold cavity, but not from the force plug. The molding of pieces with internal undercuts is considered impracticable and must, therefore, be avoided. In the design of articles produced from moldable rigid and elastomeric plastics, it is important that consideration be given to the easy removal of the part from the mold cavity. Draft or taper should be provided, both inside and outside. Also, it is important that the surface of the molded piece, and hence that of the mold, particularly on the vertical or tapered walls, be polished to a high luster finish. If the molded piece is straight-sided or vertical, it is necessary to exert a strong pull in order to open the mold, but by the use of taper and a highly polished surface the article is easily released. In deep-drawn articles, converging tapers assist by creating a wedging or compressing action as the mold is closed, and, in compression molding of thermosetting materials, tapers of this type increase the density of the plastic in the upper sections. There are no precise calculations or formulas for taper. The amount of taper required will vary with the depth of draw, and common sense will dictate how much. Since a designer should be on the alert to avoid details in design which will obstruct free ejection from the mold, he should provide the most liberal taper which the design will tolerate. 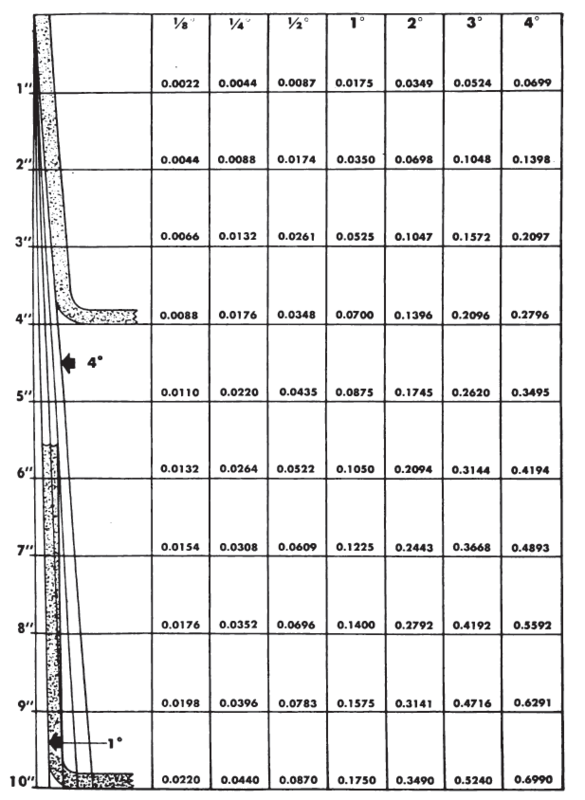 Figure following is a table of the relation of the degree of taper per side to the dimension, an inch per inch. It illustrates the effect of taper for various depths of piece. A piece 4 in. in-depth can carry a 4-degree taper, or 0.2796 in. per side. or 0.0699 in. per in. A 4-degree taper may be more than can be used in an in-depth article. Thus, in a 10-in. the piece, it will amount to 0.6990 in. per side. Common molding practice has proved that for deep articles tapers of less than 1 degree can be used satisfactorily. Tapers as small as 0.001 in. per in. have proved satisfactory for side walls of radio and television cabinets 6 to 24 in. deep. Tapers combined with round corners and generous fillets and widesweeping domed surfaces will do much to improve the appearance and the ease of molding of the majority of pieces, whether by compression, transfer or injection, and whether thermosetting or thermoplastic.